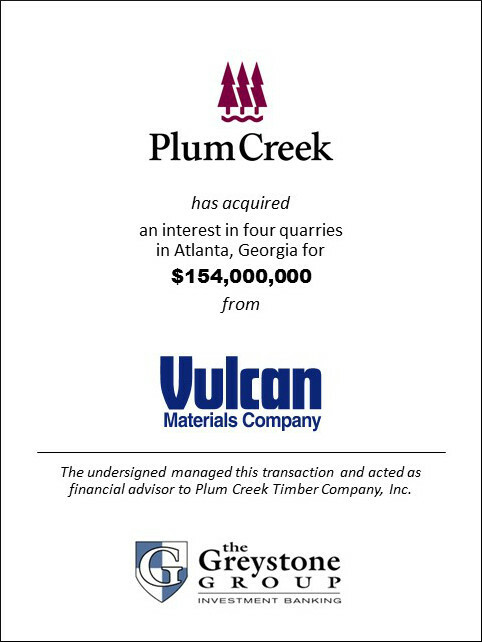 SAN DIEGO (September 27, 2013) – The Greystone Group announced today that it advised Plum Creek Timber Company, Inc. (NYSE: PCL) in its acquisition of its interest in 255 million tons of aggregate reserves at four quarries from Vulcan Materials Company (NYSE: VMC). The quarries are located in the metro Atlanta, Georgia market and will continue to be operated by Vulcan. Beginning in October 2013, Plum Creek will receive royalty payments from the production and sale of the crushed stone from the quarries for approximately 25 years. “We have enjoyed working with Plum Creek over the past 3 years, helping them develop a strategy to acquire aggregate reserves in strong growth markets. This is the 3rd transaction that Greystone has managed for Plum Creek in the past 26 months” said Tim Oitzman, President of Greystone. Plum Creek is among the largest and most geographically diverse private landowners in the nation with approximately 6.3 million acres of timberlands in major timber producing regions of the United States and wood products manufacturing facilities in the Northwest.